Liefmans | Beer Apprentice - Craft Beer News, Reviews, Interviews and Info. Hello everyone. I hope all is well. It’s time for another craft beer review and I’m glad that you’ve stopped by to join me. For today’s tasting I’m going to be trying the Liefmans Cuvée Brut produced by Brouwerij Liefmans located in Oudenaarde, Belgium. I haven’t had this beer in a very, very long time, so when I saw it on the shelf the other day I decided to reintroduce it to my taste buds. From the website, leifmans.be, this bit of information was provided. This Kriek is made with a completely different method from Kriek Lambic. It starts with old brown beer which is macerated with fresh whole cherries in shallow, horizontal tanks (every 100 liter brown beer holds 13 kg cherries). Then it matures for about 1 year, afterwards it is blended with both Oud Bruin and Goudenband of different ages. The result is a well balanced sour and sweet Kriek of great complexity. Let’s give it a try. Shall we? This brew came in a 25.4 oz. bottle and it possessed an ABV of 6.0%. It appeared a ruby red to cranberry juice color. The head was off white with only the most faint pink tint to it. It was sized fairly well and the texture was just a tad bit fizzy. The retention time was solid and the lacing looked “ok”. It was a little thin, but worthy enough. The nose divulged tones of ripe cherries and raspberry. Neither were overly sour or tart smelling. Rather mild to tell the truth. A firm hint of wood and earthiness really gave it a “round” smell. It was almost “soft” smelling. Deeper into the aroma I began to pick up on a fragrance of freshly baked pie crust. I thought that was very, very nice. The flavor was also quite mellow. Well balanced. Lightly soured and delicately tart cherries showed themselves first. The woodiness came through next and it appeared to really pull the sourness back and helped balanced the overall profile. More of those earthy tones were noted and toward the end I began to decipher some sugary sweetness. Not bad. The mouthfeel was medium bodied. Mostly dry and just a wee bit sharp. It was kind of refreshing too I thought. The carbonation was of medium strength and just a very light touch of warmth was felt after the swallow. A nice shot of flavor was left behind for me to enjoy between sips as well. Well, I feel that this is a pretty good beer. It wasn’t as sour, acidic or tart as I remember it being, but it still provided enough of those characteristics to keep me interested for the duration. Not to mention the drinkability was very good. I just kept turning up the snifter for another gulp. 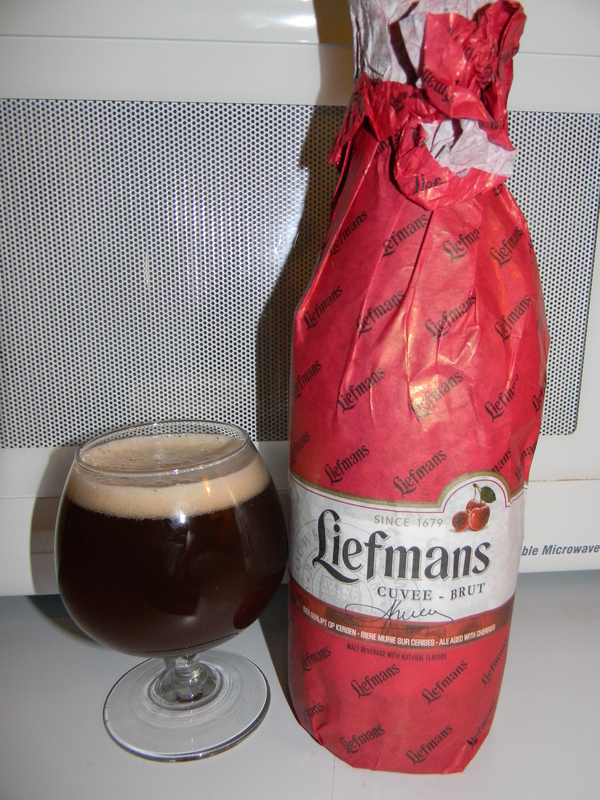 I’d say give the Liefmans Cuvée Brut a try if you have yet to do so. It’s a staple in the beer world and one that every beer geek should try at least once. I’m sure that I’ll pick it up again sometime. It’s one of those beers that always seems to be available, yet I tend to walk by. I really should quit doing that. I need to make myself grab a bottle from time to time because it truly is a solid and enjoyable drink. Either way, if you guys try it be sure to let me know what you think in the comments. I’d love to hear from you. Hello again everyone. For today’s craft beer review I’m going to be trying a 2011 Goudenband produced by Brouwerij Liefmans located in Oudenaarde, Belgium. This will be the first Liefmans that I’ve had in a long time. I’ve always enjoyed them though, so I should walk away satisfied if all holds true. From the website, liefmans.be, we find this bit of information regarding the Goudenband. 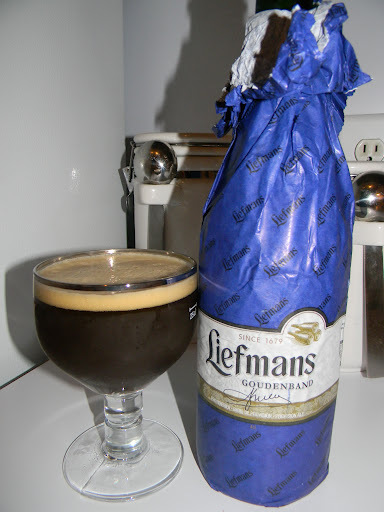 Liefmans Goudenband is a brown beer of high fermentation, brewed with special malts. This beer will mature for 4 to 8 months in the cellars. The taste of this typical provision beer evolves positively over time. This 8.0% ABV beer comes in a “pajama” wrapped 25.4 oz. bottle. It poured a murky, brown to burgundy color with a khaki tinted head. The crown was sized ok and somewhat smooth with just a touch fizz. Both the retention time and the lacing were decent and stuck around for a few moments. The nose released hints of tart, soured cherries. It had a very unique and enjoyable earthy/vegetable type of fragrance as well as a tiny bit of woodiness. Like a very relaxed red wine bouquet. Very well balanced and harmonized. I really liked the aroma. It was very nice. The sourness and the tartness were a little more reserved within the taste. Still duly noted however. Touches of black cherries and slightly roasted malt. It even had a nutty taste that was like walnut or something. Quite yeasty, earthy and woody as well. Pretty good I thought. The mouthfeel was medium bodied. Dry, chewy and sticky but smooth. A medium to low amount of carbonation tickled the throat. A slight warmth and a good dose of flavor was left behind after each drink also. Well, I think we have a very nice beer right here. It really hit the spot when I tried it. It was very easy to drink and it really opened up a lot as I worked my way through the bottle. The tarty,sourness really began to sedate as it warmed, which let the earthy/woody components shine. I could easily see myself sipping on this during the Fall as the weather starts to cool. I may see about finding another bottle or two just for that occasion. Have you guys ever tried the Liefmans Goudenband? What did you think of it? Feel free to leave a comment if you would like. I’d love to hear from you. As always, thanks for reading guys. I really appreciate it.